With our Serpents and steps game for "Colours" you will be teaching the German vocabulary for the topic Colours. The language you will teach is in the vocabulary list below, and consists of 10 . Snakes and ladders is a classic children's game transposed to the MFL classroom. 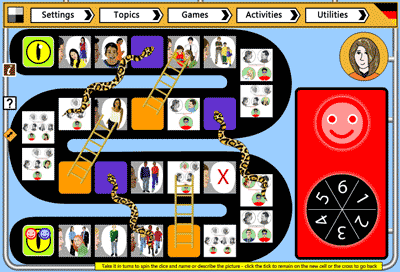 Teams compete by moving their counter along the path avoiding the snakes and climbing the ladders where possible.Serpents and steps is one of 10 FREE whole class games to teach German at iclanguage.com. Snakes and ladders uses it's familiar game format to teach languages. Teams take it in turns to roll a spinning dice wheel - their counter lands on a picture square - the team must name or describe the picture in the target language. If the class decides the language was acceptable, the team can remain on the square by clicking the tick. Otherwise, they must return to their former square by clicking on the cross. Landing at the base of a ladder or the head of a snake works the same as with the board game snakes and ladders. From the head of a snake your counter will slide down to it's tail. From the base of a ladder, your team's counter will climb to it's top. The language (speech and text) for a picture is available by clicking on the question mark once the counter has moved. Spin the wheel with numbers on it by clicking it. Your counter will advance that number of squares. If you can name the item on the square you land on, click the 'tick' button. Your team counter will remain where it is. If you can't name the item, click the 'cross' button and your counter will return to its original position. If you land on the bottom of a ladder, or on the head of a snake, you do not have to name an item. Select the number of pictures you would like to show. You can choose to show all the pictures in a topic or to show / teach only the first 5 / 10 initially and the second 5 / 10 at a later stage. Select whether to use on-screen help buttons while playing the game. No help switches off the help button: it does not appear on the game page. Text only will show the German label for the topic selected when clicked. Speech only will play the German talk file for the selected topic when clicked. Text and speech will both show the German text and play the speech file. The help buttons appear on the game page as a question mark in the corner of the picture at bottom right. No scoring in this game.